77816 members and growing! 888 currently online. 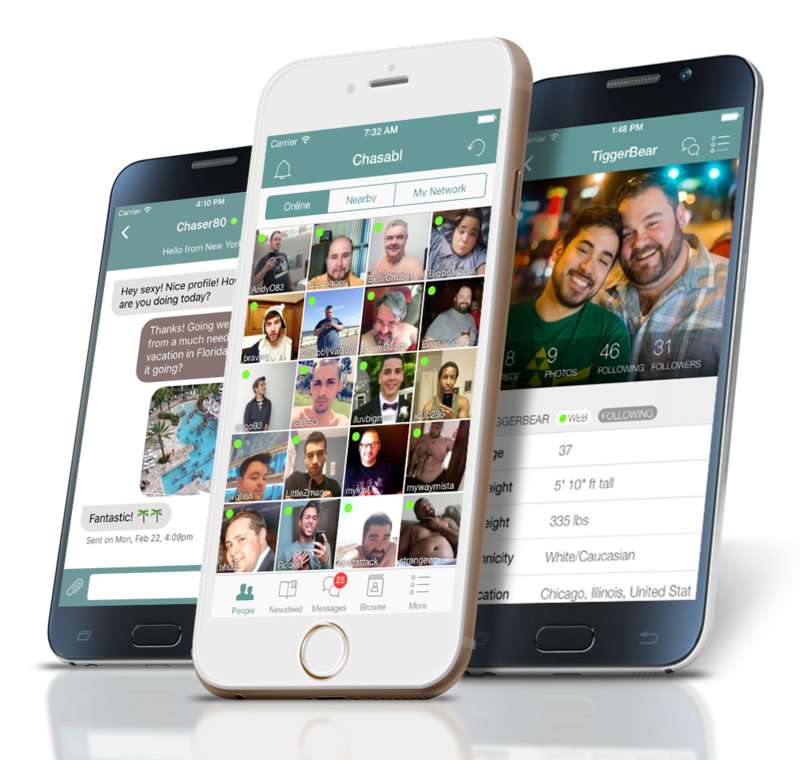 Everyone’s got their somthin’—whether it’s chubby guys, muscle dudes, skinny fellas or big-bellied bears—and Chasabl makes it easier than ever before to find Mr. Right or Mr. Right Now. Learn more about chubs, chasers and bears on the Chasabl FAQ page. And find out about the Chasabl site itself on the About Chasabl page. So what are you waiting for? Sign up, log on and chase your happiness! The newsfeed provides a summary of what people are writing on their walls and the comments others are making. You can customize your Global and Local Newsfeeds by setting your site-wide filter with basic criteria—from physical attributes like height, weight and body type to personal info like relationship status, shared kinks and whether they like your body type. You can also choose to follow the members you like and stay informed of what they publicly share with My Newsfeed. No matter your personality, Chasabl has tools you can use to interact with the people you like most. Some users will use the private chat and messaging. Others will like the video chat room, or commenting on photos. The choice is yours. You can follow members, post to their public wall, like their posts and photos, send them a private message, or just a flirt—a kind of predefined message—to break the ice. On Chasabl you will find advanced search tools to help you discover guys in your area, who share your interests, who fit your type or have the same kinks as you. No matter what your criteria are, we’ve got a search for it: Age, location, weight, BMI, sexual kinks and preferences, body type, languages spoken, relationship status, etc. Don't wait any longer to find the chub, chaser, chubby bear or bear of your dreams. Location is everything! So of course we built our site with powerful location-based tools. On Chasabl you can specify your location in your profile by entering a city name, zip/postal code, or even an address (don't worry, it will always remain private). The idea is that the system will translate your location to geographical coordinates to calculate your relative distance to other people. This way you can see who's nearby, sorted by distance. You want to know who actually lives in your area, not just somewhere in the same state. You can do that on Chasabl. On Chasabl, chat and messaging are integrated. If you're busy chatting with others and can't respond to a new message right away, that's fine! The chat message is kept in your inbox and you decide when to answer it. Unless you specifically delete them, conversations are saved so you can always refer to them later. And if both you and the recipient are in for a live chat, you can just keep adding replies to the conversation window: The replies you receive will instantly appear on the page, without the need to refresh the page or keep checking the inbox. Beyond the newsfeed, the My Type filter allows members to customize what types of members show up in a variety of quicklists, including members nearby and online, members who’ve recently viewed your profile and recently uploaded photos. The filter can be easily turned on and off, allowing you to seamless switch between a global and customized site experience. Take a moment to play with the criteria in order to get it right—try narrowing and broadening it until you find the right balance. Chasabl is like a "gated" community. No user content (profiles, posts, photos, etc.) is accessible from Internet search engines such as Google and Yahoo, or from unauthenticated users. In addition to that first layer of privacy, all sensitive data such as your birthdate, email address, location coordinates, is kept confidential. You can also opt to block specific users from accessing your profile and content on the site. Lastly, if you're ever thinking of leaving the site, you can easily delete your profile and all of your user-data will be permanently wiped, no questions asked. Use Chasabl in one of the seven languages supported: English, French, German, Spanish, Italian, Portuguese, and Japanese. In addition to languages, Chasabl supports many other very useful internationalization features, such as displaying dates and times in your local format, and displaying weights, heights and distances using your preferred unit of measurement. All conversions are made automatically by the system so you don't have to even think about it.